As part of the General Nemo Warmachine model I was working on the other week, I thought I might try my hand at making my own weathering powders. On a recent visit to my local craft store, I found a small set of pastels that had the perfect colors for just this experiment. This whole thing started because I was looking for a light grey powder color and wanted to see if I could save a bit of money by making my own. Forge World has a Grey Ash colored weathering powder, but it looked a little too warm for my liking. I'd love to hear from anyone who has used that particular color though. When I found the pastels in the craft store, I figured I was in business. I remember reading somewhere that you do NOT want to use oil pastels because they won't work like regular pastels that you can shave or grind up into a fine powder. I made sure I had the right kind before buying them. Keep in mind, I bought these a while ago and they've been sitting on my desk ever since... it wasn't until this project that I broke them out to see how they'd do. I was told that you should have a few varaitions of each color for variety. Things like black don't count, but your browns and such is where it matters. This is definitely true. Being able to apply a variety of colors really helps with the realism on your models. My normal setup looks like this. I open all my powders up and set them aside. I grab my "custom" weathering brushes that I made by taking some of my old brushes and cutting the tips off (in effect making them into soft stipple brushes). I have a few different sizes depending on how big of an area I want to cover. The real big brush with the blue handle is for dusting off the excess powder in the end. I also work on top of a sheet of paper that catches all the loose powder as it falls. It makes it easier to clean up in the end. Now the powders I use are from Secret Weapon Miniatures. I went through and picked up a handful of browns I though could be used for things like dirt and rust effects along with black for good measure. Since I wanted to test out my new grey "weathering powder," I broke open my pastel sticks and grabbed my X-Acto blade. I started scraping off some of the stick into a small pile on my desk. So far so good. I grabbed a brush and started applying it to the model just like I do with all the other"real" powders. That's when I realised making your own is not as good as buying the real stuff. My homemade powder doesn't stick anywhere near as well as the real ones do. There was no pigment left on the model even after a couple of attempts at applying it. Then I gave up. In hindsight, I might have tried grinding the pastel up even finer, but I figured I did a pretty good job the first time carefully scraping it away. I stood there for a minute trying to remember how much I'd spent on the pastel sticks that were supposed to save me lots of money. Thankfully, I don't think I spent that much on them. It's a good thing I bought the small pack with only four sticks in it and didn't get the huge assortment like I was thinking about doing. Save yourself the headache and buy the real thing. Trying to make your own really only results in a mess and money wasted that could have been spent on actual powders. I know the real ones can get a little pricey... and all of them are like that it seems. It adds up fast especially when you want to pick up two or three variations of each color so you have plenty of variety. I will say they are like static grass though. One tub (or jar) will last you your whole life unless you're cranking out a complete footslogging Imperial Guard army every other month. As for me, I'm sticking to the real ones and saving my money until I have enough for a good light grey powder. Anyone have any recommendations? Try a little acrylic medium binder, it can help. Hey Ron, that is a disappointment. I was thinking about doing the same thing after reading a suggestion about turning pastels into weathering powders in the Forge World Masterclass book. Did you use hard pastels or soft? Your first picture looks like it could be of a hard pastel, which I think makes a difference. Hard pastels have less pigment and more binder, which may explain why your end product looks more like a dust than a powder and why you had difficulty with coverage. I'm surprised it worked so bad for you. I made very good experience with the home-made pigments (but OTOH I never tried the purchased ones). Usually I fixate them with White Spirit after applying them - works great for me. For anyone that wants to try this: You MUST use Oil Pastels, not Chalk Pastels. That may well have been the problem here. I'm looking into this same issue- weathering powders are expensive! 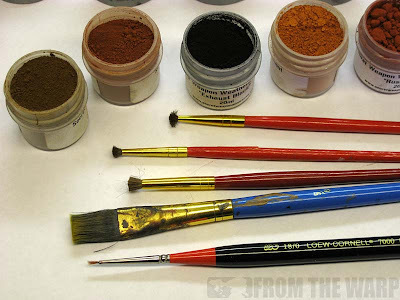 I'm going to try using artists' pigments (the kind that you mix with mediums to create paint). These are cheaper than the powders. I also figure that using sand paper instead of a knife would have worked out better. It may look the same to the naked eye, but there's definitely a difference. I learned this when I used to make powder for model rocket engines. The more you mill a powder to make it finer, the better it works, but it pretty much looks the same as powder that hasn't been milled. I make my weathering powder with pastels too. Gary Therkildsen : I think it's a "hard" pastel. It says compressed on the package for what that's worth. Varangian: So it's oil pastels and nothing else? And here I thought those were the ones to stay away from. Reid: I may try the sanding if I do it another time. At this point, I'd probably do better just to stick with the real thing and save myself the headache. Short answer: Pastels are horrible. Don't use them. Buy professional pigments from Secret Weapon, MIG or Vallejo - I have not used the FW ones and so cannot recommend them. Long answer: All pastels are a combination of pigment and binding agent. Low cost pastels are made with low quality pigments. The binding agent, normally a wax, means that you're applying wax and cheap pigment to your model. The binding agent is going to react differently with your fixer or thinner than the pigment will - which gives you unpredictable results. With a professional pigment you're getting pure pigment that was tested beforehand to ensure compatibility with the common thinners and fixers you're going to be using. The cost of a pigment typically runs $5-9 depending on the company in question. A bottle of pigment is going to last the typical hobbyist several years. You get what you pay for. There are also pro pigment brands out there that include adhesives. Avoid these for the same reason you should avoid pastels -- you want a PURE pigment. If the brand boasts that you don't need to fix the pigments in place don't buy it. @Colonel Shofer: If you add acrylic medium to pigment you've made paint. This will certainly help it stick to the model... but it's paint. @Klaus: white spirit is the way to go with pastels as it will disolve the binding agent and lock the pigment in pace - but you're going to get less predictable results than you will with pure pigments. @Varangian: Using oil pastels means you're painting your models with oil. That's fine... but you'll get a better result from a dry pigment, especially for most of the effects you can only get from pigments. @Reid: Good weathering pigments are the same as good artists' pigments -- with the difference that MIG, Vallejo and Secret Weapon have tested the pigments specifically for scale model applications. I'll stick around to answer questions - or take heat from the folks that love their pastels - but whichever brand you pick I cannot over-recommend pure pigments over pastels. I like both, but tend to lean towards pastels. However I almost always use them wet- with water or thinner. the effect is different than paint, wash or inks. TY for that, you will note I said "a little". TY for your post, it was very useful. My pleasure - and Ron has asked me to put together a post on pigments. I'm actually trying to make time to do an intro video... that isn't boring. My original video spent too much time on different types of pigment and a lot of information that might be interesting (to some) but is really only useful to folks like me that sort through hundreds of pigments to find just the right one. I realize I'm a little late to this topic, but in the interest of saving some money and experimenting, I went for charcoals as the base for my powders. In particular, the Artist charcoals that are like compressed sticks for sketching. I scraped off a bit onto a container, then used a paint brush to brush the charcoal into lines, cracks, whatever I wanted to accent. I then took one of those ladies make up brushes, and brushed the excess charcoal off in the same direction, in this case the technique was applied on some Valkyries. This gave the finish an impression of flight. I also used it on engine parts to get some grittiness in spaces. After working an area, the charcoal needs to be fixed in place, which you can use hairspray to do. It is a very easy technique and fairly cost effective. I recently acquired some browns and flesh tones to experiment with. If you ever go over to Bell of Lost Souls, the Elysian army that was featured a few times on "Pic of the Day" is mine and I used that technique quite heavily on the entire army. NOW have said that, I am also a big proponent of powders. I used them for different types of weathering. So rather than say one technique is better than another, just realize that they are just tools that you can use to accomplish a task. Use the right tool. Honda: Better late than never. Hairspray you say? Does it affect the color of the "powder" underneath? I definitely agree with your last bit, one thing is not better than another... but it's a matter of finding what works best for the situation. It does not affect the paint or the charcoal at all. However, and I should have put this in the original response, you do need to fix the charcoal before you seal it, otherwise a Krylon type of sealer (what I use) will actually "absorb" the powder and greatly reduce the effect. I have no idea how it does that (diminish the effect), but it does. Been there, got the T-shirt. The good news is that if it happens (i.e. didn't fix), you can always go back and apply more charcoal, fix, then seal. I got so caught up with the potential, that I had some Sentinels that I wanted to put a weathered white wash effect on (army is winter themed) and I ended up "painting" the model with white charcoals, fixing, the using black charcoal in the recesses for depth. It ended up looking like one of those Pzkw IIIs trying to get to Moscow in '41. I really like your site and will make it one of my regular stops. You put some excellent hobby tips on it. Honda: Interesting. Thanks for the insight. Sometimes I think I learn more from the comments that folks leave than I do the stuff I post about my experimenting. what kind of pastels should i use? oil? 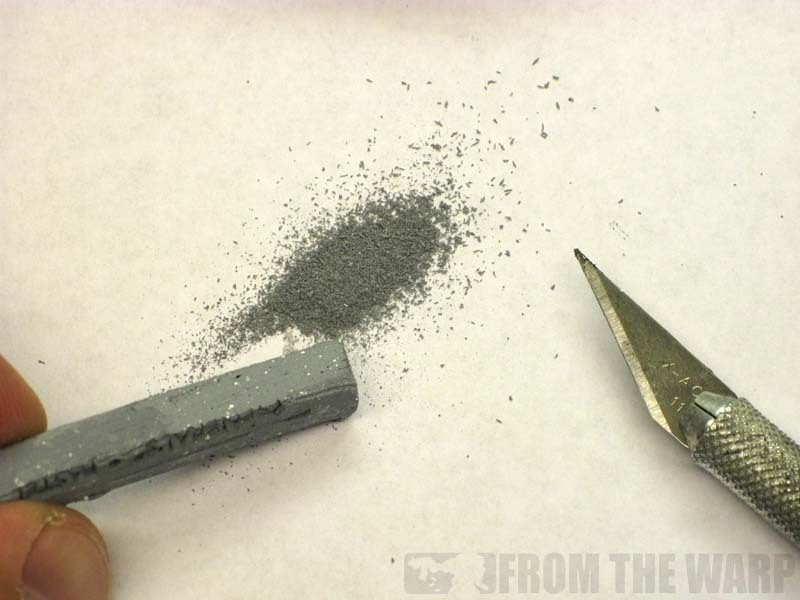 Read on - you'll find that Ron found that making his own weathering powders was a big mistake. Go commercial: MIG, AK, Secret Weapon are all good brands. Anon: Justin is correct. I found that going commercial was definitely the way to go. Making your own might sound fun, but the higher quality you get with commercial products is worth it. This means you're never applying pure pigment to your model and the chances of having something go wrong are high -- especially if you're working with a thinner or fixer that might react badly to the wax. You also run the risk of having the wax go one way, the pigment another, and the chalk a third if you're using cheap pastels to make pigment washes. In the end there's nothing good about saving a couple of bucks on pastels when a pot of pigment is going to behave properly and last the life of your hobby. I have made my own powders in the past with great success. You were onto something when you mentioned that the pastels may work better if they were ground more finely. Get some 400 grit wet/dry sandpaper and run the pastel back and forth across it to produce a very fine powder. I have not used pastels, but have had loads of luck with plain old charcoal...give it a try. And, I doubt the powder alone would stick very well to a glossy surface, so, start with a matte surface or, as someone else mentioned, you may be able to experiment with some type of binder.